Kathy Sherwin was crowned the Women's State Champ. 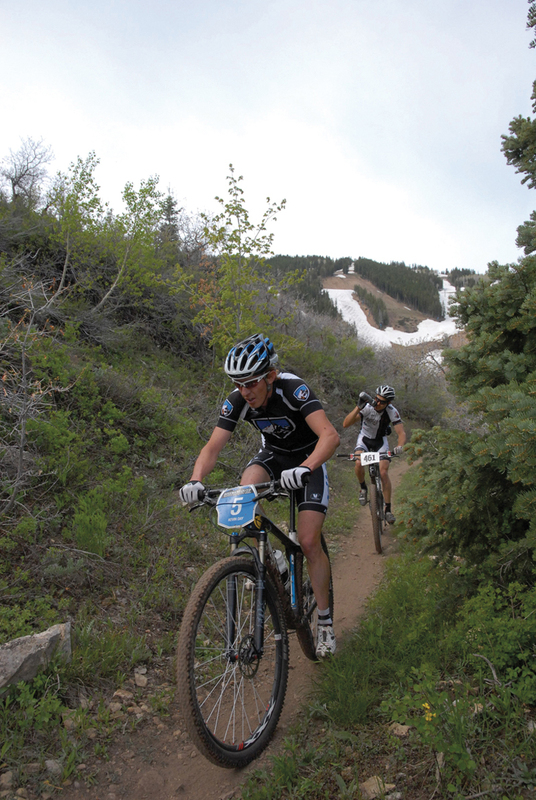 Nearly 270 racers showed up June 11 at The Deer Valley Resort for the 20th edition of the Deer Valley Pedalfest. Starting near the Snow Park Lodge, the course immediately hit racers with a steep slippery climb up the bottom of Rosebud ski run. A right turn long traverse east across the bottom of the Freestyle Skiing World Cup Venue lead riders into a rolling singletrack section through a grove of aspens. After exiting the aspens, a long decent through the pines to the base of Deer Crest chairlift brought the course to its lowest point. From here the route returned to the start finish after traversing the scrub oak hillside above the Snow Park Lodge. Course conditions were generally dry with some wet sections near the melting snowpack. The steep climb out of the start-finish combined with traffic on the singletrack sections proved to be the determining factors in the outcome of the racing. Kathy Sherwin, winner of the pro women's race, said course knowledge was critical. Knowing where to pass proved to be vital as the course presented few opportunities. The start climb had many racers practicing their cyclocross and hike-a-bike skills. The steep, slippery surface combined with heavy traffic made it more practical at times to run the climb as a means to gain places over riders struggling to ride the section. The tight singletrack may have directly affected the pro women's outcome as on lap two they became mixed in with a slower men's field that had started 2 minutes earlier. Australian national champion Katherine O'Shea (Torq Nutrition) lead out the first lap. 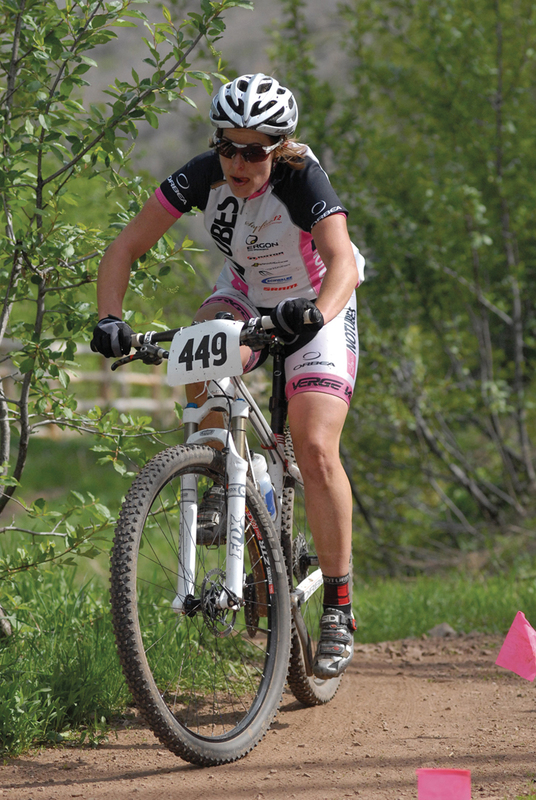 Followed by Sherwin (Stan's No Tubes), Sarah Kaufmann (Elete Nutrition), Kelsy Bingham (Jamis), Erika Tingey (Jan's/White Pine) and Kara Holley (Mad Dog). Sherwin made good on her course knowledge and slipped past O'Shea at the bottom of the course. Climbing steadily back to the start area, Sherwin held a small gap over O'Shea heading into lap two. The others held position behind the leaders. Going into the single track sections for the second time the women caught the men's expert field. Sherwin and O'Shea got in ahead of the men, while Kaufmann, Bingham and Tingey got mixed in with the men. With clear trail in front of them, the two leaders extended, while the chasers lost ground unable to pass. Sherwin went on to finish two minutes ahead of O'Shea. Kaufmann finished third overall. Left: Kathy Sherwin was crowned the Women's State Champ. On the men's side, junior rider Noah Talley led out the first lap while Geoff Montague and Kevin Day (Kühl) kept pace. On lap two, the Roosters Brewery/Bikers Edge team made its presence felt. Nick Fisher of the Rooster's Team upped the pace with teammates Jonny Hintze and Brent Pontius in tow along with Montague and Day, while Talley dropped off. Fisher broke his chain and was out. On lap three, it was down to Day and Pontius. “At the start of the third lap, I knew this would be my only chance, and so I went for it on the steep section and put a little time on the descent and held him off from there,” said Day on his race winning attack. He completed three and a half laps of the course in 1:47:13. This was his first championship win since 2002. When he started the race, he didn't realize it was the state championship race, “I would have probably buckled under the pressure had I known.” When he finished the race, he was the State Champion, and a happy rider. Hintze would end up third on the day behind teammate Pontius. With invites to the USA Cycling MTB National Championship in Sun Valley in July on the line, turnout was high and racing was fast. In all forty four men's invites were claimed in the non professional classes. The women laid claim to seven bids. The top 15 riders in each category and age-group qualified.